A blog by Yorkshire-based freelance journalist Tim Chapman, featuring a mix of news, links, thoughts and photos on economics, regional development, science and technology, and much else. Unless otherwise indicated, all content is copyright Tim Chapman. 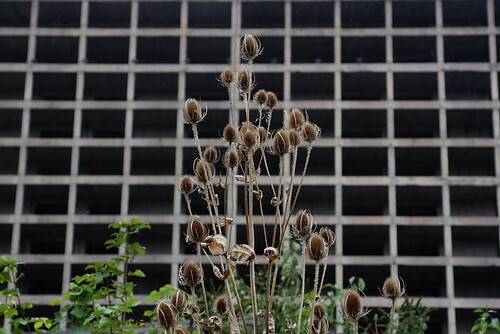 I'd been meaning to get up to Sheffield's Park Hill estate for a year or more, since first seeing the vast wall of hollowed-out flats while driving by Ponds Forge beneath. There wasn't any great rush - according to recent reports in the Sheffield Star, the project (estimated cost £160m) won't be complete till around 2017. It's three and a half years since I wrote about the plans here. I had a free morning in Sheff last Friday, so popped over. I think it's the first time I'd actually been up close to the place - looming over the city like some demon fortress, it had a fearsome (and mostly undeserved) reputation when I was growing up in the city. If it's still an unnerving place, it's an environment of eerie solitude rather than one of social threat, like stepping into the partially autopsied carcass of some sprawling municipal beast. Part has been stripped back to the concrete skeleton, secured behind high steel fencing; but the bulk has just been emptied and shuttered, and you're free to walk at will. All seemed deserted, although parts of the upper estate are still inhabited. It's an interesting place to visit at the moment. 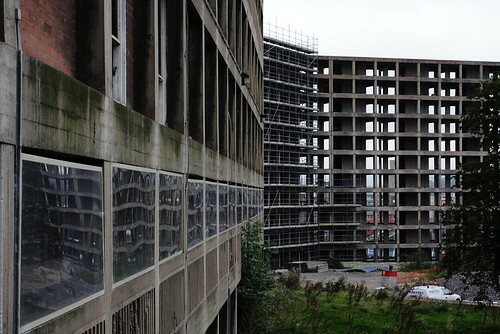 I've doubts whether Urban Splash's grand plans will ever come to fruition, or whether this unique building will disappear from Sheffield's skyline. But the stripped frames of this first phase seem to hold a strange promise, of brutalism turned gothic, the bones of some monster waiting to be reborn. Big Gordon puts sustainable regional development at the centre of his policy menu (presumably designed to help distance him from the less popular aspects of Blairism), with proposals for five new 'eco-towns' to be built on brownfield sites around the country. It's a headline-grabbing initiative, combining leftish/green sustainability with property-owning rhetoric for Middle England. There's no doubt that more new homes are needed, and brownfield redevelopment is the only way to go, but one wonders if the initiative will include anything that wouldn't be happening anyway. The first (and so far only) named site is an ex-MoD base at Oakington in Cambridgeshire, which was bought by English Partnerships for a 'sustainable' 10,000-home development last year. I'd be surprised if none of the schemes in the former South Yorkshire coalfields aren't swiftly adapted to join the programme, if it happens - maybe the housing development alongside the Advanced Manufacturing Park on the 750-acre Waverley site on the Sheffield/Rotherham borders, again headed by English Partnerships. Might even consider moving for that. It'd make the dear lady wife's commute a lot shorter and, if the concept does catch on, there's surely a book to be written about the development of and life in a shiny green Brown town. The portal will target workers in public relations, press, marketing, broadcast, advertising, design and digital media in the same region covered by the North West Enquirer, which folded after just five months. How-Do will also be a gateway to nearly 200 blogs written by north-west professionals drawn from the media, marketing, broadcast and design industries. The website will carry daily industry news, features, profiles of companies and major industry figures and blogs. Mr Jaspan and a team of freelance journalists will compile and edit content. "There is so much happening across the region within the media and creative sectors that trade publications and the regional press cannot accommodate it all. We plan to cover breaking news, the deals and the gossip together with in-depth analysis and expert comment," Mr Jaspan said. "We also want people working in these sectors to actively contribute, helping us to showcase all the fantastic creative and commercial work being produced across the region." Interesting story in the Yorkshire Post about concerns in Sheffield over the knock-on effects of the boom in city centre residential development. Big 'urban living' developments have mushroomed across the city centre, and continue to do so, with the number of city centre residents reportedly increasing by 250% in the past four years. Over half of the city centre flats are owned by private landlords. There are now fears that the situation could have adverse effects on Sheffield's housing market, as speculators help to push up prices and the council's own waiting list for rented property continues to grow. As a result, councillors have ordered a detailed report into the market changes, where most new apartments are beyond the reach of those with an income below £40,000. Some councillors are concerned that the housing market has priced many young people out of ownership and created accommodation which may be under-occupied in many cases. Despite those concerns, statistics produced by council officials suggest only seven per cent of rented apartments are empty at any one time. The figure is a stark contrast with Leeds, which underwent a similar boom in city living, where the rate is about 40 per cent. It's hard to see this situation as sustainable - and not just because of the effects on the city's broader housing market. With an over-supply of rented flats, rental yields have already fallen to marginal rates. Private owners (the vast majority of whom are presumably speculative investors) must then rely on continued rises in the capital price for their returns. With a 'correction' in the housing market long overdue, a lot of purchasers are going to find themselves at a loss - with a strong likelihood of a large portion of the stock going on the market at a depressed price. While that might be good news for the housing associations who need to expand their stock, it's probably not for the longer-term prospects for these huge housing schemes. The glamorous urban living apartments of today are likely to be the high-rise hellholes of tomorrow. Academics say despite massive amounts of public funding to improve business, productivity and earnings in the north, it has only managed to make things worse. They said no city north of Derby has an economy that is performing better than the national average, according to the report which was commissioned by the Government. And Sheffield is in the bottom five places when it comes to recording new patents - a measure of inventions and breakthroughs in industry. But Sheffield Attercliffe MP Clive Betts rejected the report and said business was booming. "Go around Sheffield and look at the new private sector investment going on. There's new businesses in the Lower Don Valley, new residential accommodation in the city centre and the New Retail Quarter which are massive private investments. "Look at companies in my constituency such as Forge Masters, which has taken on 42 new apprentices and expansions at the business park at the airport," he added. Can't help feeling that Betts is being a wee bit daft. Wonder if he's actually read the report, 'The Competitive Economic Performance of English Cities' (downloadable here)? The damning report - commissioned by the Government - suggests public spending at levels once associated with the Soviet bloc have done more harm than good. It told ministers: "The overt policies followed so far and the unintended consequences of others have either failed to close this gap or actually made it worse"
Sheffield provides an example of a traditional manufacturing based economy that has suffered from de-industrialisation. Although there have been some improvements over the last ten years, the city’s economy is still locked into past economic forms that can be seen as hindering its competitive advantage. The local economy has traditionally been dominated by manufacturing industry, specialised in a restricted number of sectors, primarily related to the steel industry. [...] there is still a dominance of manufacturing industry, and some local opposition to diversification, identified as a force for continuity. Other barriers identified include few entrepreneurs to take forward ideas, the limited markets served by the city, and a lack of willingness on the part of the private sector to push for diversification. [...] there are still concerns over the predominance of a risk-averse culture within Sheffield, and a lack of entrepreneurial skills which may hamper the development of this competitiveness driver and so prevent upgrading of the urban economy in the future. As a result of these issues the data for Sheffield’s key economic indicators paint a difficult picture in terms of competitiveness and economic performance. 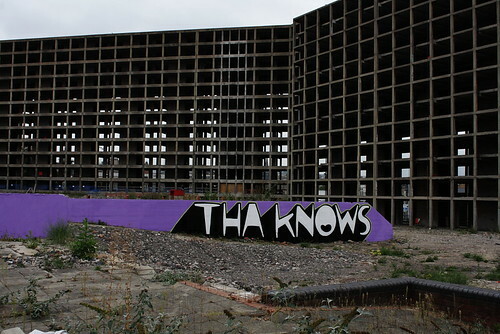 Sheffield’s industrial heritage has left deep scars in terms of the economic structure of the city, which has been slow to adjust to new economic and technological forms. Local strategic decision-makers are keen to encourage new institutional and economic forms. Despite this the history of the pathdependent nature of the local economy cannot be ignored, and the fortunes of the city cannot be turned around overnight. which seems fair to me. It should also be noted that in a city such as Sheffield, where manufacturing industry has traditionally been strong, the industrial elites associated with traditional manufacturing sectors are perceived as having a powerful role and considerable influence, particularly through the Cutler’s Company. Respondents suggested that their culture and background do not always sit harmoniously with the innovating new sectors that are contributing to drive the city’s economy; this can be a constraining factor for innovation in the city, as a force making for continuity, and not embracing change. Overall, it's realistic and pretty positive about Sheff and its prospects. There's still plenty to be done, but the report is in no way as negative as Betts' soundbites would suggest. The concept of quality of life is a much abused idea. It has often been used for political purposes with scant regard to its clear and consistent definition or the available empirical research that seeks to clarify what it means to citizens. All too often it has become one of the promotional tools employed by city agencies with the main aim of making their particular location attractive to global capital [...but] there is no necessary connection between the standard of living enjoyed by residents of a city and the economic performance of its economy. Tough containment policies are seen to limit potential investment and economic growth in both Cambridge and Sheffield. In both cases restrictions on the land and building available for high-tech and other forms of knowledge intensive industries has hampered their development. This has restricted rates of change. "Of all the countries in the world, the UK is the most risk-averse group of people there is. In North America we are doing very well and in the far east we are doing well. I want to work in the UK, it's my home. In London we are not being hired to design the office buildings we should because of a perception we are a risk and might not get planning permission. The Olympics is a good example [of the UK's risk aversion]. We are not putting our name forward because I don't think we are going to get anything there." "He was being used by everybody to reinvent themselves and when it doesn't come off he falls victim to the unfair criticism that he can't deliver," said Johnson. "An idea like walling in Barnsley to reinforce its urbanity is a creative piece of thinking. It shouldn't be ridiculed. It's the work of a genius." The Tuscan village concept comes only in part from the town's elevated position on the eastern stretches of the Pennines - it's also inspired by the ideal of a compact walled town as the model for a sustainable community. Comedy aside, no one's really expecting a sudden outbreak of ramparts, frescoes and olive groves along Shambles Street. His idea of a cross-Pennine SuperCity along the M62 belt was inspiring, and already is a reality to the extent that the motorway corridor allows people living along its length to work, shop and play at any other point along the axis (allowing for congestion round Leeds, of course). It was always a disappointment that his actual architectural work - all too easily caricatured as blobs on stilts, exemplified by his aborted design for Liverpool's fourth grace - was so unlovable and repetitive that it's little wonder that no one wanted to commission him to actually design buildings. Please, Will, stick to the theory. Another of the government's many schemes to boost the economy in the parts the market doesn't reach is coming up for evaluation. 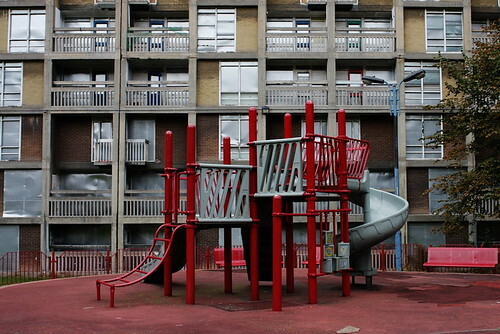 The New Deal for Communities, a ten-year, £2 billion regeneration programme aimed at the most deprived parts of England, is to be judged by a consortium led by Sheffield Hallam University, according to a press release from that uni. An admirable aim, so be interesting to see how it's all panning out. It would of course be cynical to suggest that the £9 million research funding from the scheme's architects at the ODPM might sway the conclusions. For a more informal look at another government scheme to fix perceived market failures, see this recent article on the progress so far of the Regional Venture Capital Funds. Some of the people who run the churches even think that the exotic architecture of the old cinemas helps to attract new recruits, and are prepared to spend a lot of money restoring them. “When a person comes in for the very first time, the looks of the church break the ice,” says Pastor Paul Hill of the Universal Church of the Kingdom of God in Finsbury Park. The church has been busily restoring the cinema's intricate interior, which was designed to give the feel of sitting under the stars in a Spanish village. “When they realise the beauty of the building and its lack of connection with religion, they feel good about it,” says Mr Hill. The future of such Yorkshire landmarks as Sheffield's Abbeydale Picture House and Bradford's New Victoria (better known now as the old Odeon) remains in doubt, sadly. A local lobby group is trying to preserve the former as a community centre, while the latter is facing demolition as part of the city centre regeneration programme. They are worth saving, I reckon.